On Thanksgiving Day we remember the Pilgrims and the first celebration of Thanksgiving. Sadly, most Americans, including many Christians, cannot explain the significance of the day. For most, the day is a time for gathering together with family and friends to feast on turkey with all the fixings and pass out from tryptophan over a football game. On the following day, everyone swarms the malls and outlet stores to stock up on Black Friday bargains for the next big holiday. For these people, Pilgrims are people with funny clothes, stovepipe hats, big buckles on their shoes and guns with bell-shaped muzzles. Pilgrims look cute on greeting cards or as seasonal decorations, but what is a pilgrim? Without rehashing what can easily be found with a quick Google search or repeat what I have written in the past, allow me give a different perspective on the word “pilgrim.” Dictionary.com defines a pilgrim as (1) a person who journeys, especially a long distance, to some sacred place as an act of religious devotion, (2) a traveler or wanderer, especially in a foreign place, (3) an original settler in a region, (4) one of the band of Puritans who founded the colony of Plymouth, Mass., in 1620, or (5) a newcomer to a region or place, especially to the western U.S.
About a month ago, my wife and I visited the Holy Land as pilgrims (Definition 1). We traveled a very long distance from Dallas, Texas to Israel and visited many sacred places there because of our devotion to the Word of God and our desire to visit the places we read about in the Bible. Our pilgrimage served to bring God’s Word to life in our minds and to form a stronger bond and love for the land of Israel and especially for the city where God has placed His name. June and I were pilgrims! As Christians, we are all pilgrims. Regardless of where on earth we dwell, we are strangers and sojourners in this world – pilgrims; “For our conversation is in heaven; from whence also we look for the Saviour, the Lord Jesus Christ” (Philippians 3:20). The Greek word translated “conversation” is politeuma and it means “community” or “citizenship.” Our true citizenship and our allegiance are in heaven; therefore, it is right for us to feel out of place in this world. If not, we might need to take a second look at our passport! “Love not the world, neither the things that are in the world. If any man love the world, the love of the Father is not in him. … And the world passeth away, and the lust thereof: but he that doeth the will of God abideth for ever” (1 John 2:15, 17). Knowing that this world is passing away, I am “Looking for and hasting unto the coming of the day of God, wherein the heavens being on fire shall be dissolved, and the elements shall melt with fervent heat? Nevertheless we, according to his promise, look for new heavens and a new earth, wherein dwelleth righteousness.” (2 Peter 3:12-13). As a pilgrim, I yearn with an aching heart for the Lord to return as King of Kings and Lord of Lords and make this world right again. Then I will be home, no longer a pilgrim. In the meantime, fellow pilgrim, we can thank Him for all His care and provision as we travel this alien land and for the assurance that our real home is with Him. A couple of months ago I thought I was fit enough to run, and, while You kept whispering to me not to do it, I thought I could, and did. The next day, my right knee loudly complained that I should have listened to You. Thank You for a good physical trainer that understands the anatomy that You designed and assembled enough to take it easy on my whining knee, and who encouraged me to have a doctor take a closer look. This time I listened, and I went to see my familiar orthopedist, Dr. Medlock. Thank You for the knowledge You have revealed to men and women in the medical field. Thank You for the desire You have instilled in them to devote their lives to the care of others. Dr. Medlock started with conservative means – a cortisone shot to the knee. That did not help, so he ordered an MRI. Thank You for such wonderful technology You have allowed humans to develop that see inside the human body to help doctors pinpoint physical injuries. Dr. Medlock saw that I had, for the second time in one year, torn the medial meniscus in my right knee, and it would require surgery to repair. Last Friday, May 26, 2017, I went to the Ambulatory Surgery Center at Medical City, Dallas to get the work done. Thank You, Jesus that You have allowed me to live in the United States of America where we have an abundance of good public and private hospitals staffed with talented and well-trained medical personnel that are efficiently run without oppressive government meddling. Dr. Medlock is an excellent doctor. With the use of an arthroscope (again, thank You for technology) and the skill of an excellent surgeon (thank You for Dr. Medlock), I was out of the operating room in less than an hour. Thank You for my wonderful wife, June, who drove me home in the car You gave us. Thank You for an abundance of food at every corner. June bought me a double-double Whataburger for my first meal with money You have provided through the ability You have given us and by the good employment You have provided. You have even provided the insurance to cover most of the medical expenses through the employment You have provided. Lord Jesus, Thank You for a church family, and a choir and Sunday school family and all the many Christian brothers and sisters You have blessed us with that care for us, and pray for us, and encourage us as we go through the down parts of life. You have not left us alone! Today, I am four days out of surgery. So far, You have given me the strength to walk eight blocks around the neighborhood, and I plan to walk at least four more before the day is done. Tomorrow, I will drive the pickup You gave me to the place of service You have provided for me. Thank You, my Lord Jesus, most of all because I am Yours. Lord, I feel sorry for all those who are so richly blessed by You, and they do not even realize from Whom their blessings flow. Open their eyes, Lord. All things come from Your hand, dear Lord Jesus. Thank You. Jesus was in Jerusalem celebrating the Feast of Tabernacles (John 7:2) and taught in the temple throughout the weeklong festivities (John 7:14, 37). Knowing His devotion to observing the Mosaic Law, the “Jews” looked for Him (John 7:11) hoping to find some excuse to kill Him (John 7:1). Regardless of the threat, Jesus went up to the feast anyway, albeit incognito (John 7:10). Jesus must not have posed a particularly striking appearance. He probably looked like a common, uneducated Galilean, but His speech bewildered the Jews. “And the Jews marvelled, saying, How knoweth this man letters, having never learned?” (John 7:15). To be sure, Jesus, the Word, knew the Scriptures better than they did. “Jesus answered them, and said, My doctrine is not mine, but his that sent me. If any man will do his will, he shall know of the doctrine, whether it be of God, or whether I speak of myself” (John 7:16-17, emphasis mine). The Greek noun translated “doctrine” is didachē and it means “instruction” or “teaching.” This teaching comes from God, therefore, because they were not doing God’s will, they did not understand the instruction, nor recognize the One delivering the message. The same problem exists today. One can understand the “unchurched” not doing God’s will, but sadly, many so-called “churches” preach a “gospel” contrary to the will of God, and are as fundamentally ignorant of the “doctrine of God” as are the unchurched. Jesus demonstrated kindness and compassion, but when it came to the false teaching of the Jews of that time, He pulled no punches. “Did not Moses give you the law, and yet none of you keepeth the law? Why go ye about to kill me?” (John 7:19, emphasis mine.). Jesus revealed Himself here, but the Jews failed to recognize Him. They searched for Jesus to have Him killed, but standing before them, they did not recognize Him. “Jesus answered and said unto them, I have done one work, and ye all marvel” (John 7:21, emphasis mine). Some commentators believe Jesus referred to the healing of the invalid at the Pool of Bethesda, but that was six months before during Purim. That healing took place on a Sabbath, and for that, the Jews sought to kill Him! Jesus exposed their hypocrisy. “If a man on the sabbath day receive circumcision, that the law of Moses should not be broken; are ye angry at me, because I have made a man [completely] whole on the sabbath day?” (John 7:23). It seems reasonable that if a circumcision can be performed on a Sabbath, a healing should be just as valid, if not more so. Therefore Jesus admonished them, “Judge not according to the appearance, but judge righteous judgment” (John 7:24). At this point the Jews started to realize that this was Jesus, whom they sought, and Jesus no longer hid the fact. “Then cried Jesus in the temple as he taught, saying, Ye both know me, and ye know whence I am: and I am not come of myself, but he that sent me is true, whom ye know not. But I know him: for I am from him, and he hath sent me” (John 7:28-29,emphasis mine). More than Jesus healing on the Sabbath, they hated His claim of being from Him more than anything. Jesus claimed equality with God, and it irked the Jews. “Then they sought to take him: but no man laid hands on him, because his hour was not yet come” (John 7:30, emphasis mine). Jesus caused quite a stir. Many of His hearers believed in Him, but the Pharisees and other religious rulers sought the more to take Him into custody. Jesus then alluded to His crucifixion and resurrection. “Then said Jesus unto them, Yet a little while am I with you, and then I go unto him that sent me. Ye shall seek me, and shall not find me: and where I am, thither ye cannot come” (John 7:33-34, emphasis mine). Jesus previously pointed out that these religious leaders were estranged to God; therefore, like anyone estranged from God, they cannot be with Him in the presence of God. Of course, they did not understand what He was saying as anyone in this same condition remains blind to the things of God. Finally, on the last day of the Feast of Tabernacles, Jesus offered the invitation to soften that hardened condition. “In the last day, that great day of the feast, Jesus stood and cried, saying, If any man thirst, let him come unto me, and drink. He that believeth on me, as the scripture hath said, out of his belly shall flow rivers of living water” (John 7:37-38, emphasis mine). The “belly” is a metaphor for ones innermost being. John further explains Jesus’ meaning. “But this spake he of the [Holy]Spirit, which they that believe on him should receive: for the Holy Ghost was not yet given; because that Jesus was not yet glorified.” (John 7:39, emphasis). When one places his trust in Jesus for salvation, Jesus’ promises to come and reside within him.“…if any man hear my voice, and open the door, I will come in to him, and will sup with him, and he with me” (Revelation 3:20). Of course, Jesus cannot do this physically (after all, He does have a physical body), so He accomplishes this through the Holy Spirit Who inhabits every believer. The remedy for ignorance of God and His will, is the Living Water that Jesus freely offers. Jesus promises, “But the Comforter, which is the Holy Ghost, whom the Father will send in my name, he shall teach you all things, and bring all things to your remembrance, whatsoever I have said unto you” (John 14:26, emphasis mine). “But when the Comforter is come, whom I will send unto you from the Father, even the Spirit of truth, which proceedeth from the Father, he shall testify of me” (John 15:26, emphasis mine). “And when he [the Holy Spirit] is come, he will reprove the world of sin, and of righteousness, and of judgment” (John 16:8, emphasis mine). “Howbeit when he, the Spirit of truth, is come, he will guide you into all truth: for he shall not speak of himself; but whatsoever he shall hear, that shall he speak: and he will shew you things to come” (John 16:13, emphasis mine). Ignorance of God and of the things of God dissipates by drinking in the Living Water that Jesus so freely offers. Reader, are you thirsty to know God? If so, why not take Jesus up on His invitation. Come and drink of the Living Water He offers. It is free for the asking. Jesus’ Seven Signs in John (3), https://erniecarrasco.com/2016/11/06/jesus-seven-signs-in-john-3/. This may be good for a belly laugh, but it is really tragic that Americans today are so ignorant of our nation’s history and traditions. In today’s culture, Thanksgiving Day is just a good excuse to have a day (or two) off of work, indulge in gluttonous behavior, and worship before the luminous god of football followed by the giving of alms to the god of materialism the next day all the while in complete ignorance of the significance of the day. It does not have to be that way. The psalmist said, “Therefore will I give thanks unto thee, O LORD, among the heathen, and sing praises unto thy name” (Psalm 18:49). The “heathen,” in this case, were the gôyim, Hebrew for the “nations” or the “Gentiles,” and by implication, the “godless.” Our attitude of thanksgiving should be a testimony to those that are without God not just on Thanksgiving Day, but everyday of our lives. In these “last days” we should live in contrast to those who are “lovers of their own selves, covetous, boasters, proud, blasphemers, disobedient to parents, unthankful, unholy (2 Timothy 3:2). C. S. Lewis once said, “We ought to give thanks for all fortune: if it is ‘good,’ because it is good, if ‘bad’ because it works in us patience, humility and the contempt of this world and the hope of our eternal country.” Paul expressed this same idea when he said, “Not that I speak in respect of want: for I have learned, in whatsoever state I am, therewith to be content. I know both how to be abased, and I know how to abound: every where and in all things I am instructed both to be full and to be hungry, both to abound and to suffer need” (Philippians 4:11-12). We assimilate this attitude when “we know that all things work together for good to them that love God, to them who are the called according to his purpose” (Romans 8:28). “Them who are the called according to His purpose” do not live their lives like the “heathen” who are ungrateful or “unthankful” in their life conduct. Perhaps the reason the “heathen” are unthankful is because they do not know to whom they should be thankful. That, of course, presupposes that in every other respect they are caring of others beyond themselves. If expressed at all, we often hear such empty platitudes as: I’m thankful for my job; I’m thankful for my family; I’m thankful for good friends, etc. That is fine, but thankful to whom? When the Pilgrims landed at Plymouth in 1620, they arrived in the face of a harsh New England winter. They were without food and without shelter. Of the 121 souls that departed England to escape religious persecution and “for the Glory of God, and advancements of the Christian faith and honor of our King and Country,” only 47 of the original colonists survived that brutal winter. With the help of neighboring Indian tribes, the colonists learned to cultivate and enjoy the bounty of the land. At the harvest that followed, they celebrated a season of thanksgiving to God for His providence and protection. 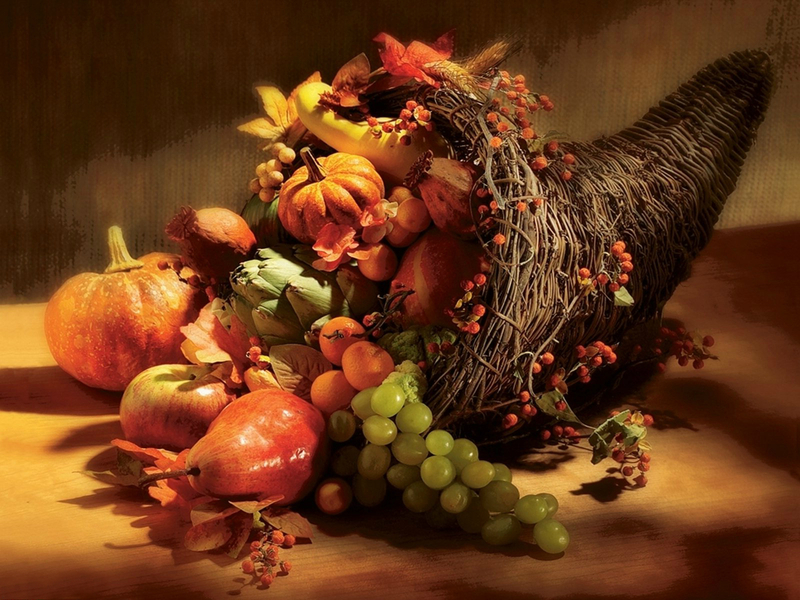 The third year after having landed, William Bradford officially proclaimed November 29, 1623 a day of thanksgiving. In as much as the great Father has given us this year an abundant harvest … and in as much as He has protected us from the ravages of the savages, has spared us from pestilence and disease, has granted us freedom to worship God according to the dictates of our own conscience; now I, your magistrate, do proclaim that all ye Pilgrims, with your wives and ye little ones, do gather at ye meeting house on ye hill, between the hours of 9 and 12 in the day time, on Thursday, November ye 29th, of the year of our Lord one thousand six hundred and twenty-three … there to listen to ye pastor and render thanksgiving to ye Almighty God for all His blessings. Would that our current national leaders adopt that attitude! No human counsel hath devised, nor hath any mortal hand worked out these great things. They are the gracious gifts of the most high God, who, while dealing with us in anger for our sins, hath nevertheless remembered mercy … I do, therefore, invite my fellow citizens in every part of the United States, and those who are sojourning in foreign lands, to set apart and observe the last Thursday of November next as a day of Thanksgiving and Praise to our beneficent Father who dwelleth in the heavens … [it is] announced in the Holy Scriptures and proven by all history, that those nations are blessed whose God is the Lord … It has seemed fit to me and proper that God should be solemnly, reverently and gratefully acknowledged, as with one heart and one voice, by the whole American people. I am thankful for my husband/wife. I am thankful for my kids. Of course, there is always the spiritual one that will remember to be thankful for Jesus, or for their salvation. Whenever I receive something from someone, whether a gift or simply a kind gesture, I say “thank you” to that individual – the giver. I don’t say, “I am thankful for the gift” or “I am thankful that the door was held open for me.” No, I thank the person. To be thankful for something one must recognize the originator of the benefit. Who gave you that husband or wife? Who gave you that family, children, home, friends, health or job? After giving that some thought, some may conclude that all those things came about through their own effort. After all one has to attract and win the affections of a good mate. Or they may surmise that their children are the “product” of their marital union. Home, job, friends, are all products of one’s own effort. Good health? Well maybe that is just the luck of the draw or the result of good genes. So, for what does one have to be grateful? To whom must one give thanks? To self or to dumb luck? To thank yourself or dumb luck would be silly! 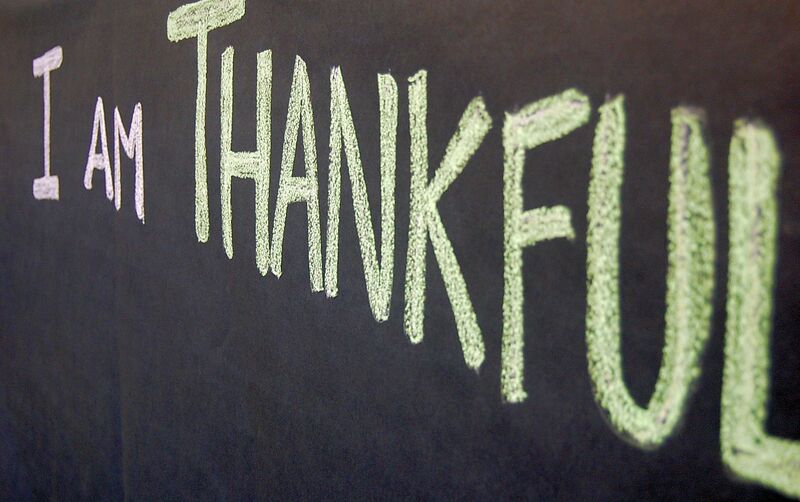 If you are truly thankful for what you have, the thanks must go to the Giver. I thank God for giving me life, and for the blessing of good health. I thank God for giving me a loving wife. I thank God for giving me sons and grandchildren. I thank God for my extended family, especially those who are “twice” family. I thank God for giving me the ability to work and earn a living and for providing a job where I can exercise those abilities. I thank God for my home and all the material blessings that fill it. I thank God for surrounding me with good friends and for my brothers and sisters in Christ. I thank God for Jesus, my Savior, and for the sure promise of an eternal home in Glory. I thank God. Comments Off on Thankful to Whom?